Braff, Chalke, McGinley & Co. 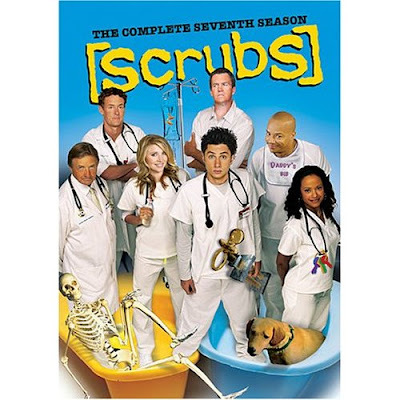 Although it's earned an Emmy, a Humanitas Award, the 2006 Peabody Award for Excellence, and countless nominations at the Golden Globes and the Primetime Emmy Awards, Scrubs is one of those offbeat, off-the-wall, and off-the-beaten path shows that has never earned the audience support or the media attention it deserves. When you ask an average television viewer about the show, most admit to seeing it a few times but it seems to be one of those that's more popular on disc and in reruns than when it airs. Perhaps part of its charm is that the series masquerades as a hospital spoof. Or more specifically, it appears to be a nice warm-up to E.R. with a gag-a-minute lines, fantasy sequences, and characters that are so strange they don't resemble anyone we could possibly encounter in real life. However, on closer inspection, I realized that it's the intelligence and creativity driving the show that has kept me engaged each and every year to the hospital comedy as opposed to E.R. which hasn't held my interest since before the millennium. Cloaked in bizarre humor and wacky plot points that at times border on juvenile and nonsensical, series creator Bill Lawrence (Spin City) never fails to layer the long-running sitcom with moments of melancholy, pathos, ups-and-downs, and true life-affirming medicine made so much tastier with the crazy shenanigans of the staff of the thankfully fictitious Sacred Heart Hospital. Instantly recognizable and one-of-a-kind, it's unlike anything else on television, yet there's something about it that speaks to an American society that's been so frustrated by our health care system, we're still able to see kernels of truth in the craziest of subplots and frankly we need the laughter of the show to cope with the all-too-true conditions we face. While the show has been rumored to be on its last legs for several seasons, plummeting in the ratings despite a loyal global fan-base and success in syndication, Scrubs has been given another shot of adrenaline by its parent network ABC Studios who are bringing the series over from where it aired with a dwindling lifeline at NBC. Returning as a mid-season replacement for a committed eighth season, Scrubs will begin making more rounds on ABC in the near future, as you can see below. However, until that happens, thankfully fans of the show including those of us who had difficulty following its haphazard scheduling debacles last year in the wake of the Writer's Guild Strike can relish in the November 11 release of the seventh season from Walt Disney Home Entertainment with this two-disc set. Capturing all eleven episodes that found the characters undergoing major storyline changes and filled with the wild bonus footage, commentaries, and behind-the-scenes featurettes Scrubs fans have come to expect and cherish with the previous DVD releases, it makes the ultimate primer to catch back up with the goings-on of the gang at Sacred Heart. Aside from the overly crowded and frustratingly difficult DVD menu that initially leads to some confusion when trying to choose which episode to play, the first disc picks up where we left off with "My Own Worst Enemy" as J.D. (Zach Braff) and Elliot (Sarah Chalke) contemplate both their relationship with one another and those to whom they're committed. The on-again/off-again pair shakes off their near-kiss and in classic Scrubs fashion, via J.D. 's constant narration as he relates his experiences in voice-over, we realize that all of the characters at Sacred Heart have to confront their own impulse towards self-sabotage and figure out how to move on. For J.D., it's finally admitting to his "baby mama," the beautiful Dr. Kim Briggs (Elizabeth Banks) that although he loves the fact that she's delivering his child, he's not exactly in love with her. Culminating in a hilarious episode called "My Hard Labor," which finds Kim and J.D. confronting the end of their relationship as their son is born and Elliot ultimately admits that she's more in love with the idea of marriage than in love with her fiance, "the Dudemeister," they realize they have to begin taking responsibility for their own actions. While J.D. 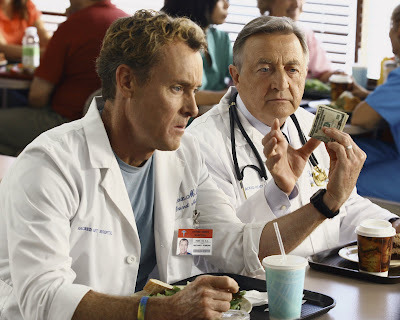 and Elliot struggle personally, they thrive professionally but their superiors, Dr. Cox (the perpetual scene-stealer John C. McGinley) and Bob Kelso (Ken Jenkins) encounter difficulties of their own. In the brilliant season opener, Cox finds himself so distracted by the fact that he cares about and likes a patient that he can't diagnose him and midway through the season Kelso's real age is revealed by an insistent Elliot intent on throwing him a birthday party, which results in him facing mandatory retirement. Of course, comedy ensues throughout as J.D. 's series-long, unexplainable, enigmatic, and still nameless Janitor (Neil Flynn) conspires against everyone whether it's taking it upon himself to become the official "Environmental Officer" at the hospital after watching the Al Gore documentary An Inconvenient Truth, starting an investigative newspaper called "The Janitorial" where he reveals that all Dr. Cox really wants is for everyone to hug him, or crafting a brain trust along with Doug, The Todd, and Ted in Kelso's office that they nickname "The Brainhouse." Although Cox jokes that now married, Turk (Donald Faison) and Carla (Judy Reyes) have become a two-headed witch in the Braff directed fantasy-laced season ender "My Princess" which was aired out of sequence due to the strike, the two start contemplating having another child and Turk pulls an ultimate surprise on his wife when he takes it upon himself to learn her native language. Yet, during all of the pranks and sight gags as well as the return of old supporting cast-mates who show up for cameos like Tom Cavanaugh's welcome return as J.D. 's previously irresponsible yet now mature older brother, Scrubs still manages to raise ethical and moral questions. This specifically shows up in a few heart-wrenching episodes wherein Elliot questions whether or not she should report a patient's plan to die with dignity and, torn between his role as a father and doctor, Cox contemplates informing a child he has cancer when his parents announce their wish to keep it a secret. While you'll zip through the eleven episodes rather quickly, perhaps the brevity of the season benefited Scrubs in not dragging out plot-points or relying too much on some old favorite stand-bys like the never-ending soap opera between J.D. and Elliot, Cox's ongoing flirtatious battle with his equally emotionally cool wife Jordan (Christa Miller Lawrence) and just enough hilarious scenes of "bromance" between Turk and his other spouse, J.D. so that it doesn't overstay its welcome. Although as a fan, I worry that when a show is on the air for so long it will begin to lose some of its creative spark (for example--see Frasier and Desperate Housewives), the ABC move sounds like a solid decision and will hopefully refuel the show with renewed energy now that its airing directly out of the studio that owns it. And not to mention that with a mid-season show, it won't have to try and produce twenty-four to twenty-six brand new episodes right off the bat, without taking the time to regroup and decide just where the show will go from there. And while admittedly it's hard to imagine that J.D. and Turk will ever grow up or that Scrubs will get the Emmy love it should (similar to the Susan Lucci and Lauren Graham snubs), I for one am looking forward to its new network premiere and hope it can garner enough interest from casual fans who enjoy the show to actually remember to tune in, set their DVRs or start regularly checking ABC's website to ensure it finally gets the audience it so richly deserves. So in the end, the doctor will see you as scheduled but will you keep the appointment? It's up to you and don't worry-- they'll treat you with or without insurance yet you always have the assurance that they'll do their very best to keep you entertained (which is more than one can say for most medical offices).